Before I start rambling on about broccoli rabe, I wanted to share some exciting news with you. I recently accepted a position doing advertising sales and new business development with Viacom - Nickelodeon. I am thrilled to be starting this new chapter in my life. This seems to be the final puzzle piece that I've been looking for and I am excited to see what this next job holds. One huge pro is the fact that I will be working in downtown Chicago on Michigan Avenue - I will be able to take public transportation to work! No more 3-hours per day in the car driving to and from work. I decided to take this week off to get a chance to hit the reset button before starting the new job. I am hoping that means a little bit of exercising, some reading, cooking and writing this week. Oh, and obviously a whole lot of sleeping in, although I am sure I will be waking up by 7:00 every morning. Let's start this week off with a little healthy eating. As far as I can remember, I was never a child that wouldn't eat his vegetables. I've always liked carrots, broccoli, asparagus and brussel sprouts. So when it comes to finding new recipes utilizing vegetables? I'm all about them. This is the first time that I have ever cooked with, even eaten, broccoli rabe. I had not expectations going into it. With that being said, please note that this vegetable can be bitter. So it is best to pair it with something that will help cut the bitterness down. I paired this broccoli rabe with the cumin grilled pork chops from last week. The combination was perfect. 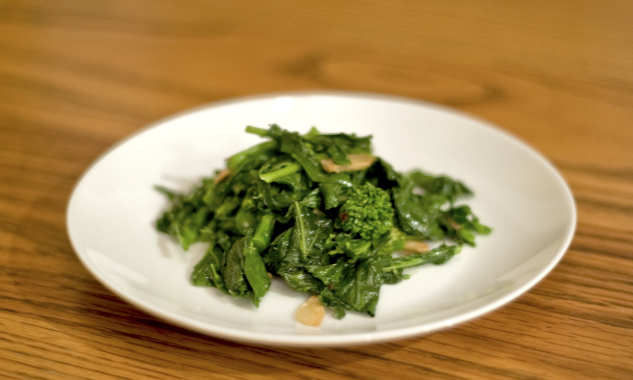 Cut off and discard the tough ends of the broccoli rabe and cut the rest of it into 2-inch pieces. Place the broccoli in a colander and rinse. Drain well. Heat the olive oil in a large pot. Add the garlic and cook over low heat, stirring occasionally, for 4-6 minutes, until golden brown. Remove the garlic with a slotted spoon and set aside. Add the broccoli to the hot oil. Add the red pepper flakes, salt and pepper and cook covered over medium to low heat for 5-10 minutes, turning occasionally with tongs, until the stalks are tender but still al dente. Add the reserved garlic, check the seasonings, and serve hot.